The underpinning assumption of public management in the developing world as a process of planned change is increasingly being recognized as unrealistic. In reality, the practice of development management is characterized by processes of mutual adjustment among individuals, agencies, and interest groups that can constrain behaviour, as well as provide incentives for collaborative action. Paradoxes inevitably emerge in policy network practice and design. The ability to manage government departments and operations has become less important than the ability to navigate the complex world of interconnected policy implementation processes. Public sector reform policies and programmes, as a consequence, are a study in the complexities of the institutional and environmental context in which these reforms are pursued. Building on theory and practice, this book argues that advancing the theoretical frontlines of development management research and practice can benefit from developing models based on innovation, collaboration and governance. The themes addressed in Public Sector Reforms in Developing Countries will enable public managers in developing countries cope in uncertain and turbulent environments as they seek optimal fits between their institutional goals and environmental contingencies. 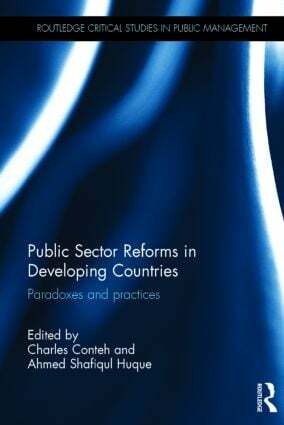 Public Sector Reforms in Developing Countries moves the study of contemporary reform out of the Western democracies to consider the impact of various ideas about management on public administration in other parts of the world. This is an extremely useful and informative collection of papers that should be read by scholars in administration and those in development.